How many puppies will be in our Golden Retriever’s first litter? We’ve been busy! Busy taking care of puppies! Yep it’s a terrible job cuddling puppies all day, but someone’s got to do it. A couple weeks ago Raven, our Golden Retriever had her first litter of puppies. Several weeks before she had her puppies we were all curious about how many puppies Raven would have in her first litter. So we did some research on Golden Retriever’s first litter size by first talking to our doggy friends at Guide Dogs of America, talking to friends and family members, drawing from personal experience, and of course a little bit of research on the internet to top it off. QUICK TIP: Are you interested in getting a puppy? YES! Our tip of the day is to get the Snuggle Puppy w/ heartbeat and heat pack toy. Bring your Snuggle Puppy the day you pick up your puppy and rub it all over his litter mates and mama. Your puppy’s first nights away from his mama and siblings will be more comfortable with the scent of his litter mates on his plush Snuggle Puppy. Way back in the day, before we had puppies, before we had Linus, we were hoping to bring home a puppy of our own. We visited countless litters of Golden Retriever, Labrador Retriever, Australian Shepherd, and Rescue Pups. Ten years later my memory of all those puppies is still vivid. The largest litter was twelve adorable eight week old Golden Retriever puppies sprinting into the house from the outside patio. Back then the smallest litter we saw was two six week old black Labrador Retriever pups. Our friends at Guide Dogs of America have experienced many, many more litters then I have or probably ever will in my lifetime. I would guess they have a litter of pups at the school nearly every week sometimes two litters a week! So what did I hear from my GDA friends? The largest litter I heard about was 16 Golden Retriever puppies! Let me say that again: 16 puppies!!! The smallest litter size was 1 lonely puppy…although only children get all the attention…right, Ali (Ali is my wife…an only child :)? After personal experience and talking to friends and family the consensus was Raven could have any where between 1 and 16 puppies. QUICK TIP: If you’re preparing for a litter of puppies you might want to take a quick look at the whelping checklist we put together for Raven and her puppies. Time for a little bit of internet research. 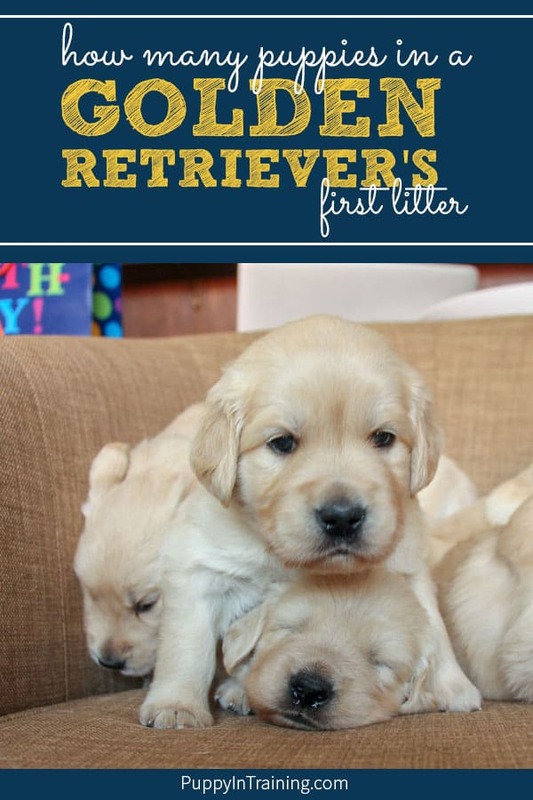 What is the average first litter size for a Golden Retriever? The average litter size for a golden retriever is eight puppies. Litter sizes vary from four to 12 puppies, and humans are not usually needed for help in the birthing process. – Reference.com. Other sites in the top 10 search have similar numbers for average litter size. What is the largest litter size for a Golden Retriever? What is the smallest litter size for a Golden Retriever? The Golden Retriever Forum and other sites mention Golden litters as small as one puppy. After talking to friends, family, and doing my internet research the consensus was Raven would probably have between 4-12 puppies with the outside possibilities of only 1 pup or up to 17 (remote possibility of 24!) puppies. Many moons ago I volunteered as a foster for one of our local rescues. We took care of litters of puppies, but the youngest pups we had were already 3 weeks old. If you’ve been following for a while then you will recall our litter of 7 German Shepherd mix puppies. We got those little cuties when they were about 3-4 weeks old and at that age they were a handful. I specifically remember one of the rescue leaders saying that 5 or fewer puppies are much easier to handle. That number 5 has stuck in my head for over 10 years! Puppies from our our Golden litter! We haven’t talked too much about Raven here on the blog, but we’re fostering her for a breeder and in exchange we get to keep some of her puppies to raise as service dogs. A few days before Raven’s due date we were told we could bring her in for an X-Ray to see how many puppies she would have in her first litter. However, the day we planned on bringing her in for an X-Ray her temperature dropped which was an indication she was close to giving birth. Rather than risk her giving birth in my car on the way to the vet we opted out of the X-Ray. I waited with Raven and her puppies for 4 more hours monitoring and making sure everyone was okay. I heard there could sometimes be hours between puppies. When Ali came home from work she took over the watch, but no puppy #7. So the answer to our question: What will be our Golden Retriever’s first litter size? SIX! At least that was the answer for Raven’s first litter. Do you have experience with litters of puppies? Specifically a Golden Retrievers first litter? If so what was the size of your Golden’s first litter? If you’re expecting a litter of puppies you might want to check out our whelping supplies checklist to make sure you have everything your need before your puppies arrive. Guess what? Raven had her second litter of puppies. Can you guess how many puppies were in her second litter? 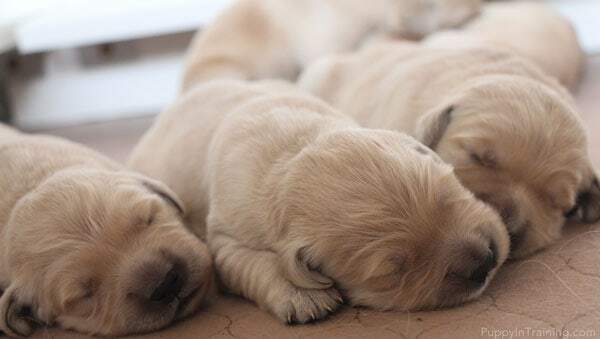 On the other hand if you’re looking for “cute pics of Golden Retriever puppies” because you’re about to bring your first puppy home then check out Puppies for Dummies. This book is a good starting point for learning the basics of raising and training a puppy. What will be our Golden Retriever first litter size? Congratulations! Our first litter was 6 pups: 4 boys 2 girls. This time we had 8 puppies: 5 boys, 3 girls. Ava’s first litter was 10 beautiful, healthy puppies- 5 girls, 5 boys. We kept one! 🤗 She is due next month with her next litter and we’ll take her for an X-ray next week. Congratulations on the first litter! Wow! 10 puppies and a nice even split between boys and girls. Raven had 6 puppies in her first litter and 8 puppies in her second litter. 8 puppies were exponentially more difficult then 6 puppies. 10 pups has to be crazy! Let us know how the X-ray goes and how many puppies you’re expecting. Our girls first litter was 13!! And they all survived! We had 7 girls and 6 boys!! Now we waiting on 2nd litter which is due in 2 wks!! WOW! Our first litter was 6 and the second litter was 8. I can’t imagine raising 13 puppies! Keep us updated on the second litter. Well Desi had her 2nd litter this morning and she had 12. 9 boys and 3 girls. Pups and mom seem to be doing fine!! WOW! Congratulations! 12 pups is a handful! I’m glad everyone is doing well. Our Golden Retriever Daisy girl just had her first litter- 3.5 years old, 11 puppies! 6 boys, 5 girls 🙂 Her mother had large litters as well, so par for the course with our line! Congratulations! Raven’s first litter was 6 and her second one was 8. I’m not sure I could handle 11! I’m hoping for smaller litters so I can give each pup more attention. Early congratulations! Only a few weeks out for you. If you haven’t already you might want to check out our whelping checklist: https://puppyintraining.com/whelping-checklist-what-supplies-do-you-need-before-your-dog-has-a-litter-of-puppies/. Raven will hopefully have her third litter late spring.